With the Fourth of July holiday almost upon us I was thinking of what things I would like to make and bring to the family picnics. So I thought, what would be better than bringing your own homemade rolls for burgers and sandwiches? It is something a bit unexpected, yet sure to be impressive. 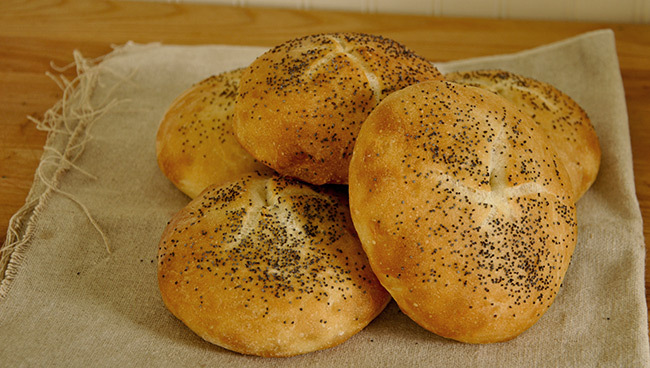 These kaiser rolls are soft and airy with a slight crisp on the exterior. Note: You don’t need to use a levain or sourdough in this recipe, but I like the added flavor profile and shelf life it lends to these rolls. If you don’t want to use one you can increase the water to 1 cup and increase the flour to 3 cups. Combine the levain (if using), water and oil into a large bowl or the bowl of a stand mixer. Add the flour, yeast, salt and sugar and mix until well combined. Allow to rest for 15-20 minutes to allow the flour to hydrate and make kneading easier. Knead the dough either by hand or by machine. If kneading by hand, turn your dough out onto a very lightly floured counter and knead for 10 minutes or so until the dough is smooth and elastic. It is a sticky dough so it will still be slightly tacky when fully kneaded. If you are using a machine, start on speed 2 for 3 minutes then increase the speed to 4 for another 3-5 minutes. Again, you are looking for a dough that is smooth and elastic, yet still a bit tacky to the touch. Place the dough in a lightly oiled bowl and cover with plastic wrap. Allow the dough to rise for thirty minutes then give the dough a business letter turn. (Remove the dough from the bowl onto a lightly floured counter and flatten into a rectangle. Fold the dough in thirds then fold in thirds again.) After you have performed the letter fold allow the dough to rise until doubled in bulk. This will take anywhere from 45 minutes to an hour plus. Once the dough has risen fully, turn it out gently onto a lightly floured counter. You want to be gentle with the dough because you want to preserve the air bubbles that have formed in the dough. This will give you a much lighter in texture roll. Divide the dough into six equal pieces (about 3.5 oz each). Lightly round each piece and let them rest for a few minutes before you finish shaping them. Shape each piece of dough into a tight round ball by lightly cupping your hand over it and moving your hand in a circular motion on the counter until the ball tightens up and holds its round shape. I then gently flatten the ball with a rolling pin or by stretching it out with my hands. This gives me a slightly larger and flatter roll, which I prefer. Then press the top of the dough with a kaiser roll stamp. This gives tool leaves the traditional kaiser roll look on tops of your rolls. The trick is to press the stamp down firmly without going all the way through the dough. Then place your rolls cut side down onto an inverted baking sheet that has been lined with oiled parchment paper. Spray the bottoms of the rolls with cooking spray and cover loosely with plastic wrap. Allow the rolls to rise at room temperature until very light and spongy, about 60-90 minutes. Preheat your oven to 400 degrees with a baking stone set on the middle rack and a cast iron skillet set on a lower rack about an hour before baking. When your rolls have fully risen it is time to flip them back over to their original position. I do this by carefully sliding an oiled bench scraper underneath the roll and gently flipping it over. Then lightly egg wash the tops of the rolls and sprinkle with the seeds. Slide the whole sheet of parchment off onto the baking stone and carefully pour 1/2 cup of water into the skillet. Quickly close the door and allow the rolls to bake for 15-20 minutes or until they are golden brown in color. Allow to cool completely on a wire rack before slicing.